Harriet Melvin, a Republican lobbyist whose clients include songwriters, the National Football League and eBay, has observed dramatic changes in the influence industry during more than two decades in the business. Political upheaval, partisan stalemate on Capitol Hill and technological innovations have all disrupted and transformed the much-maligned, $4 billion-a-year federal lobbying business. But the Donald Trump presidency, the GOP-controlled Congress and a resulting surge of grass-roots resistance — on the streets and the internet — have catapulted the lobbying sector into uncertain, though still plenty lucrative, terrain. Lobbyists like Melvin, of Thorn Run Partners, have had to adopt new ways of doing business during the fast-moving metamorphosis of K Street. Her firm, for example, now has a strategic communications unit, TRP Engage, that manages social media accounts and website design. To that end, lobbyists increasingly are adapting their methods to harness the power of social media campaigns amid the president’s atypical style of governing, which often includes policy proclamations via tweet. Trump’s administration has intensified changes to the lobbying industry that were underway well before he launched his run for office. Trump tagged the sector as part of Washington’s swamp and pledged to drain it. But former lobbyists have joined the administration and make decisions affecting their former clients. And a highly touted five-year ban on ex-officials influencing their former agency once they leave the Trump administration doesn’t preclude them from trying to influence other parts of the government. Taking shots at lobbying is a bipartisan tradition. During the Obama administration, recent federal lobbyists were prohibited from serving without a waiver. Over those eight years, the number of registered federal lobbyists declined, as undisclosed messaging and public relations work to influence Congress and the White House rose. Adding to the slide in disclosed federal lobbying: Congress banned the once-routine K Street work of helping clients secure earmarks, and the Great Recession led to cuts in lobbying contracts. While there’s been a drop in the number of registered federal lobbyists, the decline in dollars has been minimal. And the agenda of the GOP-controlled federal government has been mostly good for the business of lobbying. The first year of Trump brought an uptick in federal lobbying work, especially on tax policy, according to a Roll Call analysis of lobbying disclosure forms filed with Congress. But it didn’t beat out the total spending K Street reported during the first year of Obama’s presidency, which was about $120 million higher. The future of advocacy, while not necessarily bleak, is filled with angst and unpredictability. Put bluntly, lobbying has become increasingly difficult since Trump took office, said Doug Pinkham, who runs the Public Affairs Council. Finding the centers of power on Capitol Hill and within the administration has become more difficult over the past year, say lobbyists from both parties. “There’s a certain scrambling that has happened,” said Israel “Izzy” Klein, one of the founders of the Klein/Johnson Group. He notes that business interests once counted on Republicans to embrace their favorite policies, such as free-trade deals, something the Trump administration has not. It’s harder to identify the pressure points to actually influence policy, agreed Republican lobbyist Marc Lampkin, a partner with Brownstein Hyatt Farber Schreck, who once worked for GOP leaders on the Hill. “If you go back 25 years, lobbying was a lot more unilateral. You went to the Hill and you talked to a member or staff and to an agency,” he said. Now, he said, a lobbyist has to hit multiple stops — often with unique messages — on the Hill and within the administration, talking to more people. The lobbying practice at Brownstein Hyatt posted big gains in revenue in 2017, helped by Lampkin’s support of Trump’s candidacy and the hiring of recent GOP Hill aides, including a former chief of staff for Senate majority leaderMitch McConnell and Lori Harju, the onetime top aide to House Ways and Means Chairman Kevin Brady, the Texas Republican who shepherded the tax overhaul in the House. The all-GOP landscape has been a boon to some shops, such as the CGCN Group, whose lobbyists are all Republicans — even though the party is itself split into factions. “We can walk into a Freedom Caucus office, a Tuesday Group office, a Republican leadership office and the Trump administration,” said CGCN’s Sam Geduldig, whose firm’s lobbying revenue, as reported in federal disclosures to Congress, was up by 25 percent in 2017. Figuring out how to influence the Trump administration has proved challenging for most on K Street, and some firms have brought on people with ties to the president. Squire Patton Boggs formed a business alliance with longtime Trump attorney Michael Cohen. Holland & Knight hired the Trump campaign’s Scott Mason. And Florida lobbyist Brian Ballard, who served as chairman of a Trump fundraising committee, opened a D.C. branch of his firm. The hiring patterns show that lobbying, for all the technological changes and data disruptions, remains at its core a relationship-centered enterprise. Just ask Joel Jankowsky, who started lobbying 40 years ago when Jimmy Carter was president. Tip O’Neill had just begun his decade-long reign as House speaker, and Robert Byrd of West Virginia became Senate majority leader. Back then, Jankowsky and other lobbyists would send their paralegals to congressional hearings, and they would pound out observations on a typewriter and mail the dispatches to clients. The fundamentals are people, their connections and their interpretation of policy. Ken Glueck, who has run the in-house policy operation for tech giant Oracle for 21 years, is obviously no Luddite, but with all the tools that lobbyists have, he said there’s no substitute for an in-person meeting with a member of Congress or another policymaker. “Nothing replaces the one-on-one interaction,” he said, and his outside consultants reflect that view. He’s hired the Klein/Johnson Group, the new firm of Klein, a former aide to Senate minority leaderCharles E. Schumer of New York, and Matt Johnson, a Republican who worked for Senate Majority Whip John Cornyn of Texas. Klein and Johnson opened their shop late last year and illustrate a shift toward smaller firms rather than those owned by corporate enterprises. Even Cassidy & Associates, a storied shop that pioneered the business of wooing earmarks, bought itself back last year from the Interpublic Group, an advertising and public relations conglomerate that had acquired it in 2000. Cassidy’s Anderson said it was an effort to reclaim the firm’s destiny and remove it from the pressures of constant quarter-to-quarter growth. Johnson left the Podesta Group, once one of the hottest firms in town, which imploded last year after the special counsel’s Russia probe uncovered previously undisclosed foreign lobbying work by owner Tony Podesta. “One of the things that was a slowly learned lesson in the advocacy world when this administration came into power, was you needed to be ready to sing for your supper, you needed to be ready to justify your existence as a government program,” said Johnson, whose wife, Kate O’Scannlain, is now the Labor Department’s solicitor. Given the emphasis that Trump and Republican leaders put on cutting taxes, it’s not surprising that the first major tax code rewrite since 1986 drove most of the lobbying work in the president’s first year. More than a quarter of all lobbying reports filed in 2017 included at least some work on tax policy, though each lobbyist can mark multiple issues he tried to influence during a particular quarter. And the tax work will continue. At Thorn Run Partners, lobbyists are looking to build coalitions of companies with discrete problems stemming from the complex overhaul. Appropriations, health care, trade and transportation were some other frequently lobbied topics in 2017, each harking back to signature pledges Trump made during his campaign. 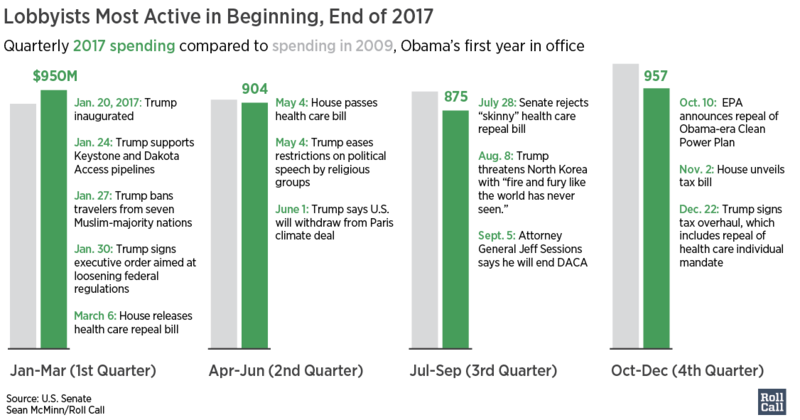 The president had varying degrees of success in keeping those promises during his first year in office. On fiscal issues, for example, Trump assured voters he could balance the budget “fairly quickly.” But the tax law he championed will increase the deficit by around $1.5 trillion over 10 years, according to the nonpartisan Congressional Budget Office. On top of that, disaster aid to help victims of hurricanes and wildfires will add another $51.5 billion this year. And the government is now being run on its fifth stopgap spending bill of the fiscal year, after lawmakers hashed out a deal to raise spending on defense and nondefense programs to get past statutory budget caps. Trump can’t take all the blame for an appropriations process gone wrong. The dysfunction on Capitol Hill, including two government shutdowns in less than a month, is also a factor in lobbying efforts. “All of this adds a mistrust and distrust among folks who have to find some level of common ground in order to produce legislation,” said Tonya Saunders, a longtime Democratic lobbyist who runs her own K Street boutique. In the lobbying world, that means shepherding clients from crisis to crisis. “We spend a lot of time in reaction mode,” Saunders said. 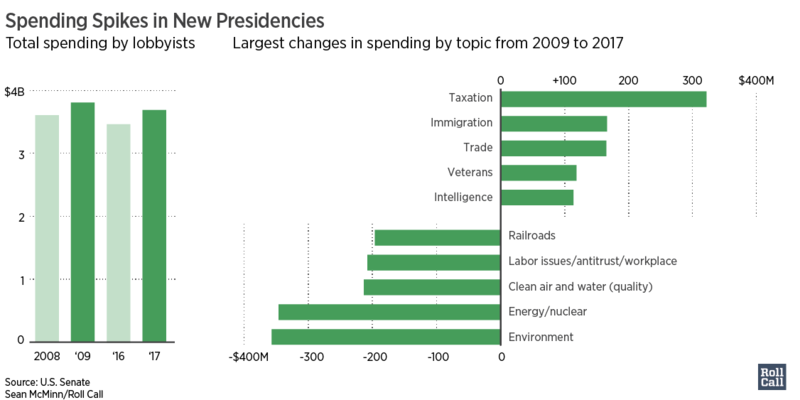 Not everything the president promised to change gained popularity with lobbyists, though. Lobbying on some issues dropped during the course of 2017. Trump said on the campaign trail that he would defund Planned Parenthood, the nation’s largest abortion provider, “because of the abortion factor.” When he came into office, 64 organizations reported working on “family issues,” which includes abortion. By the end of last year, there were only 50 reports that said the same. Trump also vowed to “appoint great justices to the United States Supreme Court to uphold and defend the Constitution of the United States.” He still regularly touts the appointment of Supreme Court Justice Neil Gorsuch as a major accomplishment of his first year in office, but many Trump policies — such as his restrictions on travelers from foreign countries, particularly those with Muslim majorities — are being challenged in court. Fifty-four groups were working on constitutional issues at the start of Trump’s term, but only 36 at the end of his first year. And 19 reported lobbying on religion issues, but only 14 by the end of 2017. Each of these drops in lobbying reports represents the lowest counts for those issues in years. Spending was also way down on other hot-topic issues for conservatives: Lobbying on welfare issues plummeted by 79 percent from the first quarter of 2017 to the fourth quarter, and firearms and ammunition lobbying went down by 40 percent for the same period. But lobbying on immigration — another hallmark of the president’s campaign — bucked the trend and soared in 2017. The number of lobbying reports indicating work on immigration issues increased by 46 percent over the previous year, and 84 percent over 2009. With a fight stirring on Capitol Hill over the fate of “Dreamers” brought to the United States as children, lobbying activity on immigration could rise even higher in 2018. The president has proposed creating a path to citizenship for 1.8 million Dreamers in exchange for funding a wall along the U.S.-Mexico border, along with restrictions on family-based immigration and ending a visa lottery program. Business heavyweights have already been lobbying on immigration, with the National Association of Realtors, Business Roundtable, U.S. Chamber of Commerce, Google and Amazon among the largest in the fray. The GEO Group, the nation’s largest private operator of correctional and detention facilities, stands to benefit from Trump’s approach to immigration. The Florida-based company more than doubled its lobbying in the last year, from $830,000 during Obama’s final year in office to $1.7 million in 2017. Robert Raben, who runs the progressive lobbying firm The Raben Group, helps build coalitions in support of expanding immigration, often directly at odds with the Trump administration’s plans. While some firms may worry about having their clients attacked from newly mobilized grass-roots activists, Raben is finding new allies. Some companies have had to figure out their lobbying strategy after being thrust directly into the spotlight by Trump’s Twitter feed, where he’s done everything from threaten nuclear war to bash General Motors for its manufacturing operations in Mexico. In multiple cases last year, lobbying by individual companies spiked in the same quarter they were making headlines over their relations with the Trump administration. General Motors, which Trump called out last January, reported spending more in the first quarter — $3.9 million — than it did in the next two quarters combined. Carrier, owned by United Technologies, reached a deal to keep jobs in the United States, a plan the president-elect widely publicized at the end of 2016. But critics attacked the agreement and the hefty tax breaks Carrier would receive. United Technologies’ lobbying subsequently soared from $2 million in the third quarter of 2016 to $3.1 million in the first quarter of 2017. Whitefish Energy, a small Montana company that suffered an embarrassing fallout after the Trump administration hired it to repair Puerto Rico’s devastated infrastructure, reported lobbying for the first time ever at the end of 2017. Whitefish spent $150,000 on five lobbyists, including former Republican Reps. Dennis Cardoza of California and Scott Klug of Wisconsin, during the fourth quarter. Of course, this activity reflects only the lobbying work captured by public disclosures, which good government groups and even many lobbyists argue are outdated. The law governing lobbying disclosure, for example, was last revised in 2007 in the wake of a big scandal involving Jack Abramoff and his network of congressional and K Street denizens. The revamp left in place exemptions for those who spend less than 20 percent of their time in support of a lobbying campaign — and neither grass-roots activity nor social media advocacy is subject to the law. That makes it nearly impossible to track the money spent on campaigns aimed at mobilizing voters. Paul Miller, a longtime lobbyist who runs the National Institute for Lobbying and Ethics, said his group wants Congress to decrease the threshold so that more advocates would trigger the law, requiring disclosure. Miller said it’s because he wants his profession to fend off the next influence scandal, instead of simply reacting to it. But Congress is a reactive institution, and it has set its sights on the 1938 law that governs foreign lobbying disclosures amid the special counsel’s Russia probe. The House Judiciary Committee approved a measure in January to overhaul the Foreign Agents Registration Act, and Senate Judiciary Chairman Charles E. Grassley of Iowa has sponsored a companion measure in his chamber. “There is a hook around foreign interference right now — that’s the lens they’re looking at,” said Lisa Gilbert of Public Citizen.